So, for the first time since Klinsmann departed Tottenham in 1998, the Premier League has another ‘Jurgen the German’, and I think it’s fair to say that Liverpool fans and neutrals alike are quite excited about it. Klopp is the managerial equivalent of chasing tequila with RedBull, a high-octane cocktail of energy, risk and potential reward. However, rather than delve into analysis of whether the appointment is the right one, whether Klopp will succeed, where Liverpool may end up because of him, I want to look briefly at the possible tactical ramifications. The following is based on the assumption that the new manager will want to play some form of the high-pressing 4-2-3-1 that he used at Dortmund. He may surprise us completely, but for now there is no basis to think that he will use anything different. The manager is in a corner here, at least until January or the summer. Mignolet it is. Rodgers flitted between a back four and a back three, changed the personnel constantly and never managed to get the unit to improve, long-term. If I were Klopp, I would pick Clyne (RB), Skrtl (CB), Gomez (CB) and Moreno (LB), make sure they know they are first choice and then give them the rest of the season to settle and become a proper defensive unit. There is a brilliant left-back waiting to emerge from the wreckage of a Moreno we’ve seen under Rodgers – I’m sure of it. Meanwhile, Joe Gomez showed in his games at left-back earlier this season that he has ‘it’, whatever ‘it’ is. Lovren has been a disaster, and Sakho has never truly convinced. While there may be good players in there and a new manager might be able to dig them out, I’d make them force their way back into the reckoning. Kolo can Kolo around until the end of his contract. Arguably the biggest dilemma in terms of personnel and finding a shape that fits, but here’s what I’d do. Milner and Can should be the two in front of the back four, at least until Henderson is fit again. Both are energetic, defensively aware and between them have a good enough range of passing to distribute. Lucas and Joe Allen can go as soon as possible. 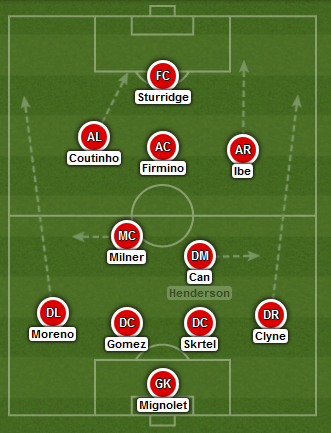 In front of them, I’d go with Coutinho nominally on the left, Firmino as the #10 and Ibe on the right. The former two to provide creativity, trickery and goals, the latter to provide real width, searing pace and solid defensive cover for Clyne. Lallana is someone I expect Klopp improve a great deal, but he isn’t there yet. I see him as the first substitute for any of the three starting attacking midfielders. The key overall will be to find the right balance. The way I see it, the two central midfielders need to be primarily defensive to act as a foundation for the attacking three to really express themselves. Klopp’s system also relies on the full backs to provide width and attacking options, which is perfect for Clyne and Moreno – they’ll have a great time. But that also means that Milner and Can/Henderson need to be available to cover their marauding full-backs when necessary – which will be often. Rodgers bought poorly in this area, and while Benteke, Ings and Origi all have their merits, there are just too many of them. Most top clubs these days have one or two out-and-out strikers. When playing mostly with one up-front, four forwards becomes a balancing act. When he’s fit, Daniel Sturridge is one of the game’s finest strikers, and must play. He’d be my first choice, with Benteke coming off the bench or rotating when necessary.